Circle line: Customers travelling between Bayswater and Baker Street in either direction will need to change trains at Edgware Road as there will be no through service. But I wonder, even now, if you've spotted the significance. It's all because later this year TfL are planning to break the Circle line apart at Edgware Road, sending anti-clockwise trains to terminate at Hammersmith instead. No more round-and-round services, not after December. And this weekend they're having a practice to see how it works. Or, indeed, if it works. Yesterday, to find out for myself, I became one of the very first passengers to ride the nu-Circle line in its entirety. And once was enough. 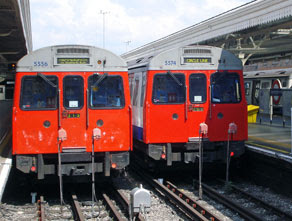 Hammersmith: You don't usually see Circle line trains at Hammersmith [photo], and for good reason - there's no orbital track at a station with buffers. But there were Circle line trains departing every ten minutes yesterday, even though they were very hard to spot. There were no signs and no announcements admitting that anything untoward was going on, nor that there might be a yellow cuckoo in the pink H&C nest. No clues either on the "next train" indicator, because this only shows which of the three platforms is leaving first, not where that train is going. Doesn't normally matter, does it? Every train departing Hammersmith is going to Paddington, King's Cross and Whitechapel, then maybe on to Plaistow or Barking. But times are no longer normal. Rears of trains are not to be trusted, so the only way to find out where they're heading is to walk right up to the far end, to the driver's cab, and to read the destination shown on the front. It definitely said WHITECHAPEL on the front of mine when I boarded. But I think the driver tweaked it before he set off, because I stayed on the train right to the end and we didn't go to Whitechapel, we went to Edgware Road. Twice. Wood Lane: There are no "next train" indicators here, nor at any station between Hammersmith and Paddington. That's probably why passengers waiting on the platform were giving us funny looks as a CIRCLE LINE train pulled in. No, really, it's true. Just climb aboard and stop worrying, because I bet you're not going any further than Liverpool Street anyway. Paddington: That's Paddington H&C. I'd be visiting the other Paddington underground station later. It would have been quicker to walk (or indeed crawl). Edgware Road (platform 1): In we pulled for the first time. Eventually we'd be pulling into the adjacent platform [photo], in the same direction, after a whistlestop tour of Central London. But not for another hour. One 'normal' circuit of the age-old Circle line ahead. Baker Street: It was only at this point that I noticed something strange. Audio silence. Usually there's a disembodied voice announcing the names of each station and where the train's heading, but on this service there was nothing. Quite pleasant, actually, but very odd. King's Cross St Pancras: Onward, ever onward. All the next train indicators on all the platforms along this northern rim were showing the train as a CIRCLE LINE service, because it was, and absolutely no passengers were confused by anything at all. The clockwise nu-Circle line journey's none too confusing round here, thankfully. Liverpool Street: But did we get an announcement confirming that the next stop was Aldgate, not Aldgate East? Did we hell. Aldgate: See, I told you we weren't going to Whitechapel. Anybody who'd boarded at Hammersmith expecting this to be a normal H&C service would be pretty annoyed at this point. But nobody in their right mind would do that, would they, not when the District Line offers a more direct service. Tower Hill: After a long pause at Aldgate, the train chugged round to Tower Hill and lots of people got on. Then, when the doors closed and we set off, the driver was finally able to switch on the on-board announcements. "This is a Circle line train via Liverpool Street and King's Cross. The next station is Aldgate." Oops. Most of the newly-boarded foreign passengers (and there were many) looked troubled by this and hurriedly checked their maps. Damn, it looked like they must have got on the wrong train at Tower Hill, damn. One Japanese gentlemen even stood up to alight at the next station, thinking he'd need to catch a train back the other way. And then the train arrived at Monument instead. He quickly deduced that the rogue announcement must have been driver error, not passenger error, and sat back down again. Cannon Street: "This is a Circle line train via Embankment and Victoria. The next station is Mansion House." That's more like it. Embankment: Busy along here, huh? I was glad I'd grabbed a seat 23 stations ago, because everybody boarding here was having to stand. Westminster: The train still said CIRCLE LINE on the front, but here we got the first admission from our driver that this might not be a normal Circle line service after all. "Customers are reminded that this Circle Line service terminates at Edgware Road. To continue your onward journey please cross to Platform 1 at Edgware Road." A bit premature, maybe, but we'd had absolutely no clues before this (and wouldn't get another before Paddington). South Kensington: Ohmigodohmigod. My carriage was suddenly invaded by a troupe of French schoolchildren, fresh from a visit to the London Transport Museum. I had to endure several uncomfortable minutes of Gallic giggling, and bottles of water being passed in front of my face, and being stared at intently by a boy called Clement. Gloucester Road: "This is a Circle line train via High Street Kensington and Paddington." True! High Street Kensington: "This is a Circle line train via Paddington and Baker Street." False! The driver was forced to switch off the on-board announcements after this, because the system couldn't yet cope with the new premature stopping arrangements. Bayswater: Hurrah, Clément et ses amis est descendu. And the train still said CIRCLE LINE on the front, even though it was terminating at EDGWARE ROAD. Paddington: One stop from the Circle's end, and the driver finally got round to mentioning that we weren't going much further. "Customers are reminded that this train terminates at Edgware Road." Bad luck for all those suitcase-laden souls who'd arrived at Paddington on mainline trains from the West, because they'd only be able to travel one stop before having to change trains again. This proposed Circle line severance isn't going to please everybody. I'll tell you tomorrow about what an organisational nightmare Edgware Road was. Plus I'll tell you why the anti-clockwise nu-Circle line is likely to be even more confusing.